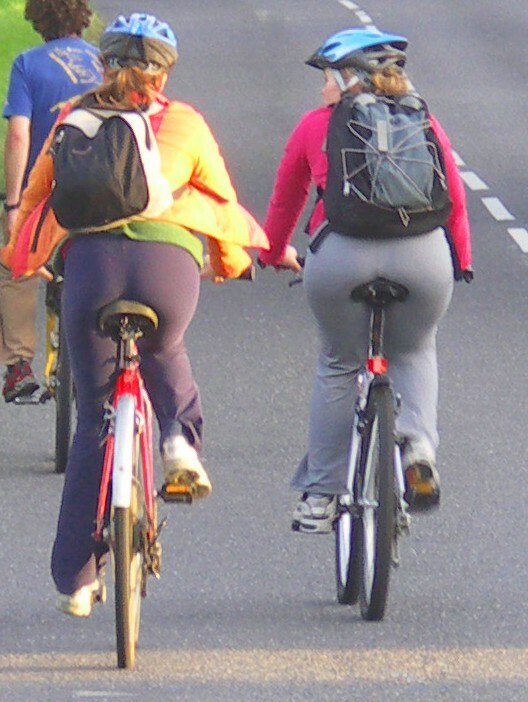 I tried something new yesterday – a local women’s cycling group. I’ve bicycled for years, from the time my father taught me how when I was six (and oh how I remember that first lesson. No training wheels in our family meant Dad had to hold up the bike while I wobbled around and figured out how to push the pedals and keep my balance). At times, I’ve been pretty serious about it. I’ve even done two centuries, although I’ve never raced. But I’ve usually ridden by myself, or with one or two other people. Still, there’s a great group of women cyclists here in town, so I finally gave it a shot. There were ten of us of varying abilities on a short, rather level ride. We stopped frequently to let the slower ones catch up, which is a really sweet feature of this organization. No one gets left behind. If you have a flat, someone helps you out. What a concept! We had one pretty inexperienced rider, so the rest of us spent quite a bit of time waiting for her (she made the whole ride and was smiling at the end!). While we waited, we chatted about our favorite rides and how often we go out, getting to know each other a little. Instead of being competitive, it was low-key and fun. 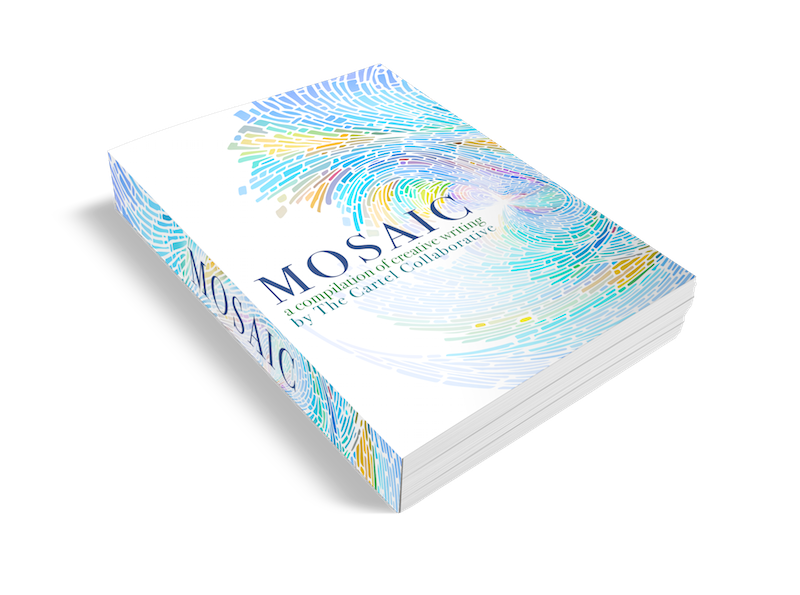 Putting together Mosaic was a bit like that: sharing common interests with a group of people, and making sure no one got left behind, while we all learned something. Plus we were smiling at the end (this time because it’s such a well-written book). But that isn’t really what I want to talk about in this post. I was thinking a little bit tonight about who I write for, as in who do I have in mind when I write. I went to a talk by Ruth Ozeki this afternoon, and she said that she writes for herself. That doesn’t sound very collaborative, does it? Yet it works for her, as she’s won numerous awards for her novels, and the auditorium was packed with people who seemed to have all read her most recent book (it was the Bend Community Read this spring). And if I think about who I write for, it’s people like myself. People like the women I rode with today. How can I do otherwise? I admire someone who can write a book for children, or for teenagers, when they’re no longer one themselves. But I’m not like that. I write what I want to read. I write to explore issues which concern me. Things such as what it means to be a woman with a career, how to find a calling in life, how to move past childhood wounds and find self-worth, or deal with a difficult relationship. Sometimes I explore larger issues such as poverty, cruelty, or environmental destruction. And occasionally, I just have some fun and play around with the world of magic and adventure while throwing in a dash of these other issues. Ruth Ozeki did say something interesting: she strives for a balance between tragedy and comedy. I like that concept. I hope I manage to do that. How about you? When have you collaborated on something, or made sure no one got left behind? How did that work out? 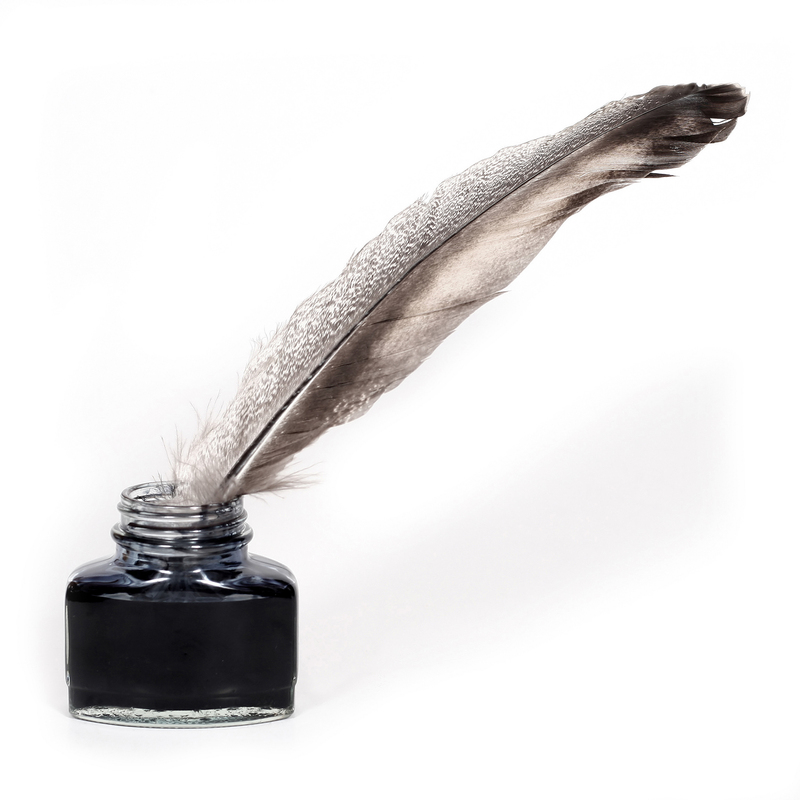 If you write, do you write for people like yourself, or for a different group? Please leave a comment and let me know. 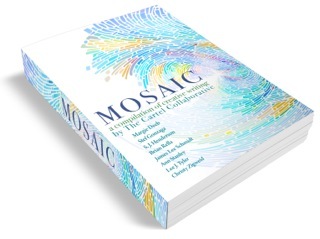 And don’t forget that Mosaic, A Compilation of Creative Writing is still free. Click here to get your copy. And don’t forget to leave us an honest review! With a sigh, Josephine dropped her head on the chest, hoping to catch a little of the jasmine scent Grandmother Rose used to wear, and feel again her grandmother’s kindness and love. She imagined burying herself in the old woman’s arms. If she could only bring her back to life, she would stop being so lonely and upset. But that, of course, was impossible. The lid lifted easily, its leather hinges still intact. Velvet skirts covered in beads and mirrors filled the top tray. Again, she was a child. Her mother walked in the front door at Grandmother Rose’s in one of these outfits, her arms loaded with presents. Josephine ran to her, and she swung her around and around. Then Josephine ripped the paper off one of the presents to reveal a baby doll in a pink dress with a matching hair bow, exactly liked she’d wanted. She squealed and hugged her mother. Her mother hadn’t stayed long, maybe a few days. After her mother left, Grandmother Rose held her while she cried herself to sleep. How many times had that happened before she’d learned not to get excited when her mother visited? The last time, the day of Rose’s funeral, she’d seen her mother park in front of the house, and she’d gone into her room and closed the door. That’s an excerpt from my short story, Heritage. 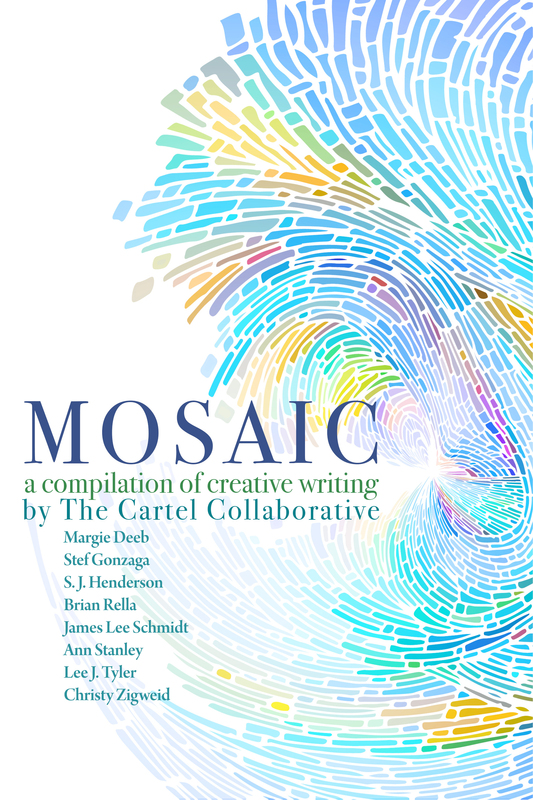 The full story can be read by downloading Mosaic, a Compilation of Creative Writing, by the Cartel Collaborative. The book is free, and you can get it on Amazon by clicking the link below. Or go here to find other formats. If you’re curious about the story behind the story, here’s a little bit about how I wrote Heritage. This story was born out of a writing prompt in my local writing group. I no longer remember what the prompt was, but I remember what I free-wrote in our twenty minutes; Josephine took a necklace she’d found in her mother’s home to her aunt. I opened with Josephine driving up to her aunt’s home in a downpour. With this, I had two themes: cleaning out the home of a mother from whom she had been estranged; and a beautiful old necklace found there, which belonged to her aunt. The rewriting started immediately. At first, I attempted a very short story, which I took to my writing group. They found it too complex for something that short. It must be a novel, they urged. I went home and tried expanding it, adding a father, two brothers, and a host of relatives. It grew into a childhood of gypsy wanderings, with all kinds of complexities, but I couldn’t make it work. I researched old necklaces, trying to build a story around the one Josephine finds. Eventually, I abandoned the enterprise, but my subconscious kept the ideas alive, and the files stayed on my computer. Along came James Lee Schmidt, with his suggestion to compile a book of stories. With a short deadline, I scanned back through my computer and found my abandoned novella. Why not pare it back to its origins? Goodbye brothers. Goodbye wandering childhood, and so many other unnecessary bits and pieces. Josephine, though, needed expansion. She was a cardboard character in my original story; she had to come to life. With more years of writing experience since the initial version, I knew this was key. Who was she – not just what she looked like, and what she did for a living, but what was her character like? What made her that way? I don’t want to give too much away, but I made her a high school physics/math teacher. To match that, she’s introverted, a bit intimidating, a bitter loner who takes refuge in numbers, yet she’s sweet underneath the hard crust. This may sound like an awful lot of modification, but I think of a story as a wad of wet clay. So long as you keep it wet, you can create a bunny rabbit, wad it back into an amorphous form, make a horse, add a saddle, then change it into a donkey. Until it’s dried, it can become anything, and that’s half the fun. Once I liked my story, I sent it my co-authors for critiquing. There were a few comments which were along the lines of “what are you talking about?” If a reader says that, I know something needs fixing, even if it isn’t the spot they marked, so I made a few more significant modifications — adding cousins, for one—and sent it back to them. There were far fewer instances of “huh?” this time. After that, it went to a professional editor. By now, I was pretty tired of this wad of clay, and it was getting dry, at least in my mind. Mirel Abeles, my wonderful editor, suggested brown eyes, longer ears, and a larger saddle. I saw the wisdom of most of her words, so I dug in hard one last time. Finally, came the day when she gave me a thumbs up and it seemed I had a nice tale, free of extraneous commas and other bloopers. Now comes the hard part, at least for me, which is asking for your feedback. Please read it and leave a review on your favorite retailer (or all of them). Reviews are the only way we, as independent authors, get found. Thank you so much! Over the past three days, I’ve brought you to the point where the stories were finished. Margie Deeb took these and created a beautiful .pdf for us, which you’ll be able to download for free (yes, FREE!) on Wednesday. She chose an elegant style, with black and white graphics for each story, sort of a wood-block look, times new roman font for the text, and a modern font for the story titles. 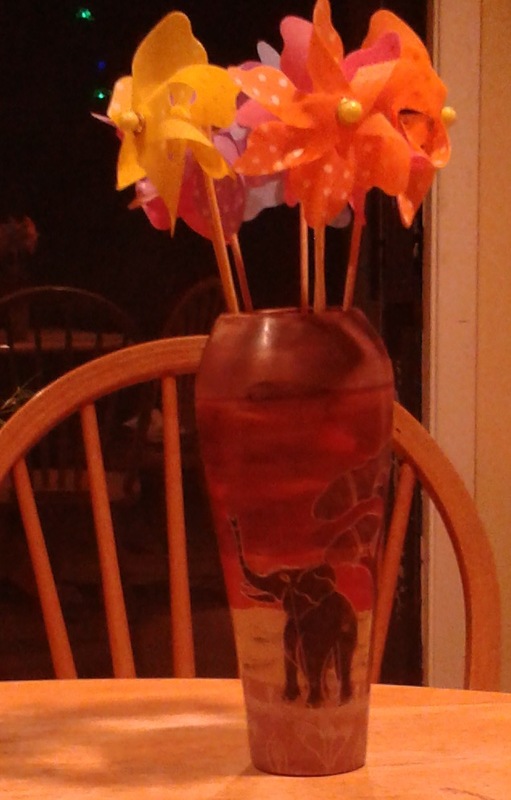 She also set up a table of contents, to ease moving around in the .pdf. We each wrote bios for the end of the book. I can’t even imagine all of the hours which she put into this. She caught typos, and sent our chapters to us for proof-reading, link-checking, etc. This was all volunteer, guys! James Lee Schmidt, with our input (and a lot of that!) wrote an introduction. He helped Angie with the cover, and Margie put it all together into the document. Finally, we proofed it, and we had a product!!! Yippee! But we weren’t done, yet. I’ll talk about that tomorrow. Right now, though, it’s time for you to meet James. He looks awfully serious, doesn’t he? This photo could be a Rembrandt, or some other Dutch Master, like Vermeer, especially with that hat…. Anyway, Mosaic was James’ idea. We were all enrolled in The Story Cartel Course, sending stories back and forth, and chatting, when he asked if anyone wanted to put together a compilation. A few of us signed on, and the book was born. He took the lead in setting up ground rules and making decisions. He was also a great cheerleader and techie support. Since it’s Sunday, I thought I’d reveal our cover. Also, because I’ll say a few words below about Angie, who designed the cover. Isn’t it beautiful! And you can get our book for free, starting Wednesday, March 25th. Yesterday, I mentioned the first drafts, then the critiques. After getting their first critiques, each author rewrote their pieces, using the critiques to improve the plot lines and flow. Some added more tension, some made their characters more interesting, all kinds of things. My one story expanded from a short thousand or so words to about two thousand, as I recall. We critiqued all the pieces again (round 2, but it was a good idea). After that, everyone went their own way for a while, as we edited and then each hired our own professional editor. I was surprised and delighted that I liked working with my editor. I’d never really done this, but she nailed the issues with my stories (and two thousand words became 4600 in the original short-short). Without her, they wouldn’t have been so delightful (at least I sure hope you’ll like them). I’ll write more about what came next, but today I want to introduce our cover artist, Angelique Mroczka, and our fourth writer, Brian Rella. Angie is a visual artist, as well as a writer, and the owner of a small publishing company. She creates amazing covers for books, as you can see, runs workshops for writers, does one-on-one coaching, blogs, runs a podcast, and seems to do a million other things. If you go to her WEB site, you can snag her short story book. We’d hoped she would contribute a story for Mosaic, but all of those zillion other things kept her too busy. I have to say that her Web site is stunningly beautiful, but what else would you expect from this amazing woman? I don’t know if I’m making the book seem easy, but there was lots going on behind the scenes. Brian would step in and offer wisdom, encouragement (and oh, do writers need that! ), and help any time it was needed. He contributed one of the longer stories in Mosiac, an intriguing tale of coming of age, human conflict and wise beings. When we started the book, Brian had never published anything, but he had a wonderful short story, Scarlach, appear at strangerviews.com. It’s available for free, along with another entertaining story, The Bathroom Incident at Dunmaster Academy, at his WEB site, www.brianrella.com. Again, I’ve got to say, this project couldn’t have happened without every single author jumping in and doing their part. We all learned so much from each other.